'Helping You Write Right': Lis..
Former state Rep. John Hood, MTSU’s director of government and community affairs, was named Thursday, Jan. 3, by the Rutherford County Chamber of Commerce as the recipient of its 2018 Doug Young Lifetime Achievement Award for his service to the university and community. Hood, whose career spans six decades with posts in radio, banking, human resources, higher education and government service at the city, county and state levels, will be honored at the chamber’s annual “Business at its Best” event Thursday, Jan. 31, at the Embassy Suites Murfreesboro Hotel & Conference Center. In 2014, the chamber also honored Hood as its Business Legend of the Year. On Jan. 31, the chamber also will recognize Saint Thomas Rutherford Hospital President and CEO Gordon Ferguson as 2018 Business Legend of the Year, real estate executive John Harney as the 2018 Business Person of the Year and Smyrna Police Chief and MTSU alumnus Kevin Arnold as recipient of the Leadership Rutherford 2018 Pinnacle Award. “A Rutherford County native, Hood’s blood runs True Blue,” the chamber said in announcing the honor. Before Hood accepted his current position at MTSU, he represented the 48th District in the Tennessee House of Representatives from 1996 to 2008. He spent 20 years before that elected service as vice president of marketing for SunTrust Bank; 10 years at MTSU as the first director of development, followed by assistant to the president; six years as personnel manager for Samsonite Corporation; and 10 years in radio with WGNS-AM and WMTS-FM. Hood was a member of the Rutherford County Quarterly Court, now the County Commission, from 1968 to 1978 and the Murfreesboro City School Board from 1967 to 1983. 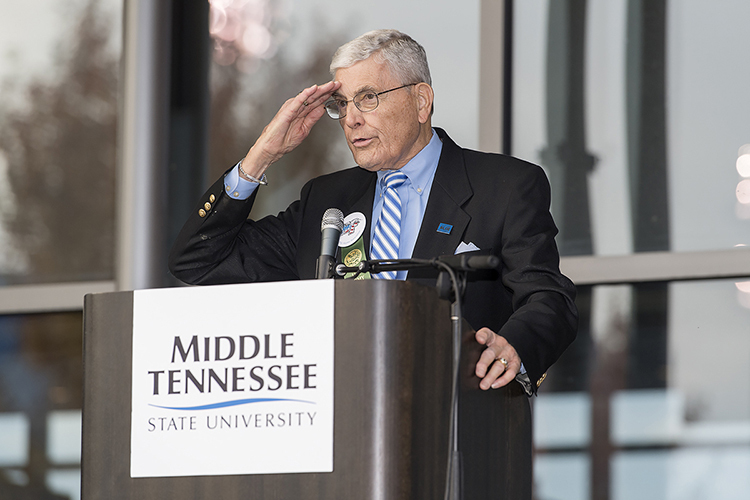 In 1954, Hood received a bachelor’s degree from MTSU followed by his master’s degree in education in 1974. He is a military veteran and served in the U.S. Army from 1954 to 1956. Hood’s history of community service is one that spans decades. His affiliations include the Exchange Club of Murfreesboro, United Way of Rutherford and Cannon Counties and Read to Succeed, along with the local Chamber of Commerce, where he has served as a diplomat for the past 18 years. His previous leadership roles include national president of the Exchange Clubs of America, Chamber of Commerce chairman, president of the Tennessee School Boards Association, chairman of the Tennessee Advisory Board for the AAA Auto Club Group,president of the MTSU National Alumni Association and treasurer of the Rutherford County Emergency Communications District. He was the 2012 recipient of the Murfreesboro City Schools Foundation’s Excellence in Education Award. Hood was inducted into the Tennessee Journalism Hall of fame in 2016, and in 2017 he was honored with the American Red Cross “Hero” Award. John and his late wife, Marilyn, have three children, Garry W. Hood, Rebecca Hagan, and Mark R. Hood; and four grandchildren, Christin H. Waters, twins Grady and Cooper Hood, and John Robin Hood. The Lifetime Achievement Award is named for the late Murfreesboro vice mayor and community leader, who also was an MTSU alumnus. Reservations for the 11:30 a.m. Jan. 31 event are $50 for chamber members and $65 for non-members. To reserve a seat, contact the chamber at 615-893-6565 or visit www.rutherfordchamber.org.